Happy Friday! Tomorrow I’m really hoping to find myself by the pool. Because I’m always inside and on the computer, sometimes I get a little cabin fever and just need to spend some time outside. There’s really nothing like soaking up some Vitamin D to make you feel like a new person. I also just find the heat incredibly relaxing. I recently picked up this coverup for the summer months and love the festive embroidery! I think with the right pair of wedges or heeled sandals it could also work for nighttime wear, but it’s so casual and comfy over your favorite bikini and these flat espadrilles. Another must-have for your pool parties coming up this summer is a pair of Laura Windsor tassel earrings. They are super light and won’t weigh you down, and come in dozens of amazing colors! I’m a big fan of the medium size. Click here to discover all the different options and styles! So cute, love that dress I just got a similar one I cannot wait to style. Love the embroidered details on this cover-up and that it can pass as a dress too – so chic! Such a beautiful dress. 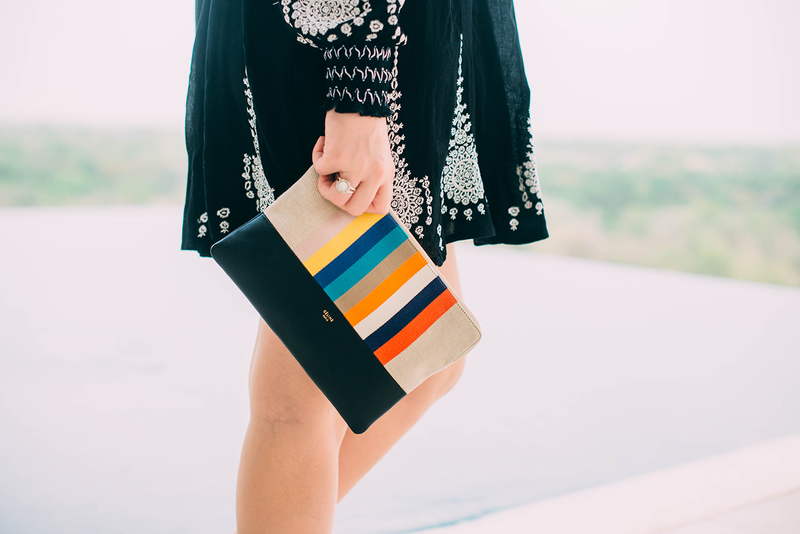 Great color pop from the clutch bag. Perfect cover for sitting poolside! Love the embroidery on this dress! The photos are stunning & I love that dress on you! This is such a perfect day by the pool look! Relaxed, yet still super chic. Happy Friday, Merritt! I love that strapless dress! Amazing place! Your espadrilles are really cute! This dress really makes me crave summer holidays! Absolutely beautiful pictures. Love the details on the dress.